I’ve watched that smirk blossom from the cherub-like visage of a 12-year-old boy to the masculine features of a 21-year-old college graduate. Back to the face. The one to Caswell’s left. While we were taking celebratory pictures this morning near the river where River Falls gets its name, we passed this brick wall spray painted with a mugshot. Like a Rorschach test, the viewer assigns its meaning. Stepson saw George Bush. The one with the W.
I see Lyndon Johnson. And I can’t read the hashtag. It is a glorious day when your child graduates from college — and a really great day for your bank account. To those of you who are graduating this afternoon with high honors, awards, and distinctions, I say, “well done.” And as I like to tell the “C” students: You, too, can be President. Funny guy, that George W. OK, enough goofing around. Bush also said this, and I share this to encourage my Stepson, who somehow became a bit cynical since the first day I met him when he recounted the entire plot to Eragon by Christopher Paolini while sitting across from me in a booth at Space Aliens cafe (he was so cute telling me all the details of a boy who finds a mysterious stone in the mountains). Maybe this commencement quote from Bush will encourage you, too. Today, some doubt America’s future, and they say our best days are behind us. I say, given our strengths—one of which is a bright new generation like you—these are not dark days. These are great days. Their season is short but their days are filled with glory. They don’t last long, and I’ve learned they malinger, rather than linger, when they’re cut and brought in the house. Don’t harvest the mighty tulip but take in its magnificence. When I think Italian food, I think red. Tomatoes. Spaghetti sauce. A nice glass of Chianti. It’s a limited vision. But it doesn’t have to be so. I conjured up the following recipe after a friend gave me some fresh lemons. I wanted to make some comfort food (and icy cold lemonade wasn’t gonna cut it), so I thought of linguine with lemon sauce. 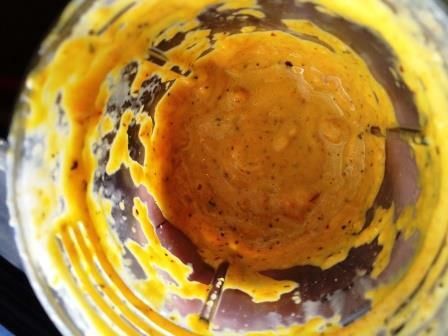 But I had some yellow peppers I wanted to use up, the inspiration for which brought me to a bunch of red pepper sauce recipes. Thus was born my Pasta with Lemon & Pepper Cream Sauce. I liked it so much, I made it again a couple of days later with some vibrant orange sweet peppers. And a couple of carrots. ‘Cause I’m just a wild and crazy gal (who likes to sneak veggies into everything). 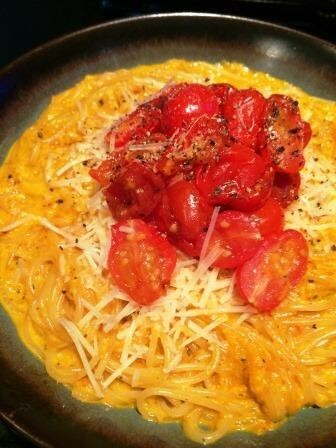 The result had all the atomic orange goodness of a bowl of Kraft macaroni cheese without any of the scary dyes or preservatives. 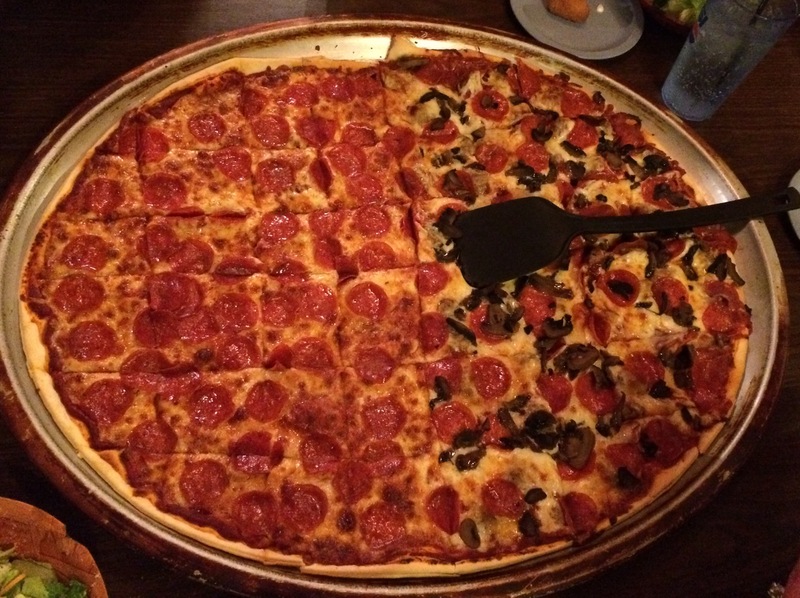 The half-and-half (or cream, if you’re really needing it) speaks of comfort. There is a ton of natural, delicious flavor here, but don’t skip over the fresh lemon juice or the red pepper flakes. 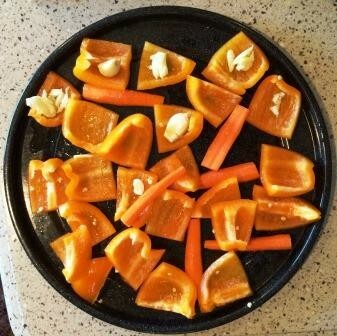 Arrange peppers, carrots and garlic on a cookie sheet. I tucked the garlic cloves into the pepper pieces so they wouldn’t get burnt (though a little browning just adds yumminess). Drizzle with oil. Add salt and pepper. Roast in a hot 400 degree oven for 25 minutes, stirring once or twice. 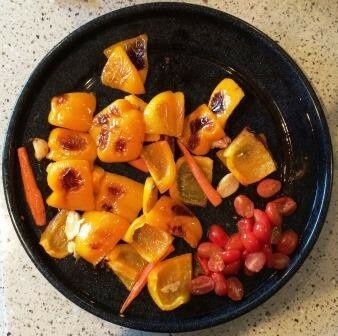 Add the cherry tomatoes and roast for 10 minutes more (35 minutes total). Allow roasted veggies to cool slightly. 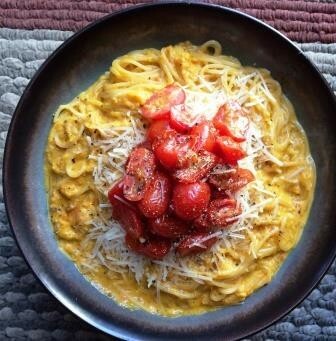 Reserve the cherry tomatoes for garnish later. Now’s the time to start your salted water a boilin’ for your pasta. Combine lemon zest, lemon juice, roasted veggies, half-and-half and dried spices in blender (I used a smoothie glass) and blend until smooth. It will be thick, like a smoothie. Taste it and add salt and pepper as necessary. When your noodles are done (al dente if you must, or a little mushier if you’re more like me), drain and add back to your hot pot. 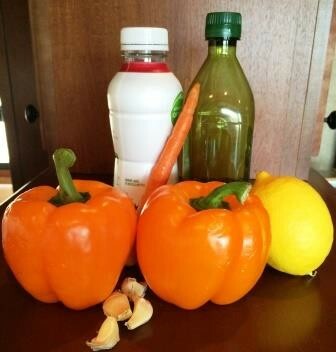 Dump your blended veggies into pot and mix well. To serve, divide between two bowls (or, if you’re really hungry, dump into a single big bowl). Garnish with parmesan, your roasted cherry tomatoes and freshly ground black pepper. Serves 1 or 2. Few flowers have the power to capture my attention like lilacs. It’s their scent, I’m sure. 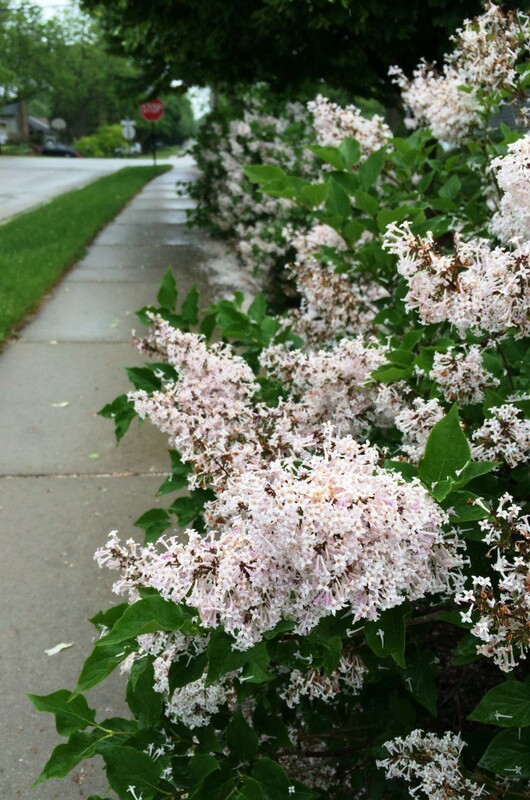 As I was running around town yesterday morning, I literally stopped to smell the lilacs on the way. My sense of smell is not exactly exacting. Sure, I can smell strong odors, but nuances elude me. Roses? Pretty. But their fragrance is weak. There’s nothing nuanced about the scent of lilacs. Their heady perfume pervades even a hypnotic run. I’ve jogged by this home at least a hundred times, but I don’t recall ever seeing lilacs there. Obviously, I was exercising elsewhere in past late Mays. Clearly, I have a thing for lilacs. I’ve waxed nostalgic for them more than once on this blog (2010, 2011, 2013). I’m always transported to the house I consider my childhood home, where a phalanx of lilacs grew in the alleyway, sweetly scenting the garbage cans for a few weeks every year. I didn’t have my iPhone with me on my run yesterday, so I went back today on a soggy Saturday morning to capture this image. The lilacs still smelled fragrant. While waiting in the drive-through for the wizards at Culver’s to create my custard sundae topped with peanut butter sauce and Reece’s Peanut Butter Cups (because one kind of peanut butter isn’t enough), I looked out the truck window and the crescent moon cast a spell. Behold, twilight. I can’t type that word without thinking of Kristen Stewart, the starlet of the movie series based on the books, but there’s no other way to describe it. 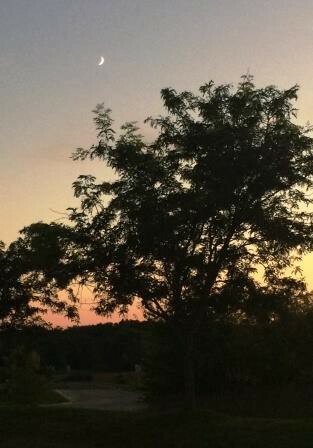 Beautiful, pink-and-lavender-bathed twilight. 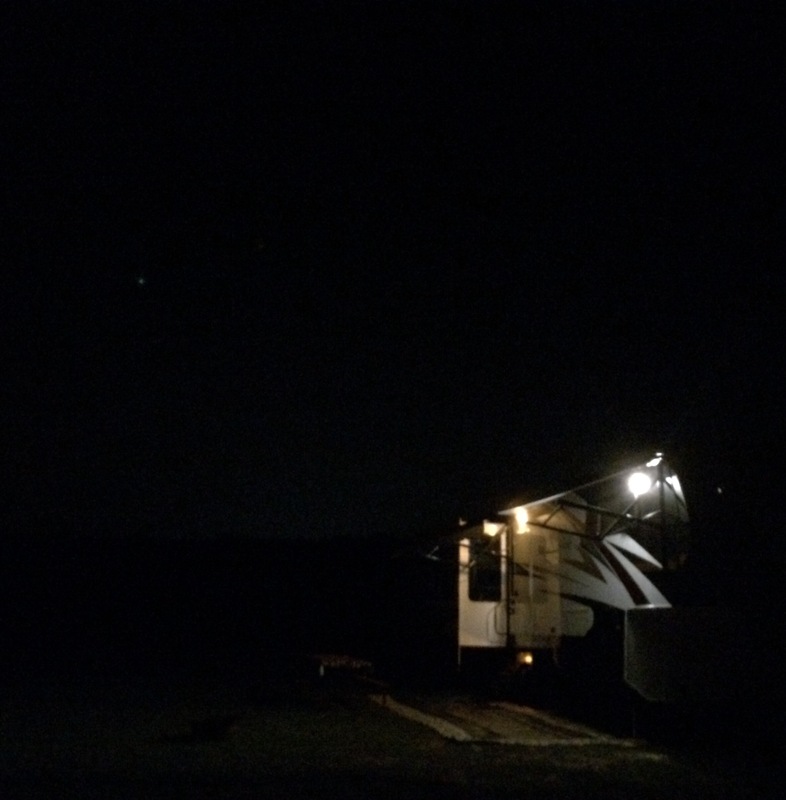 It’s not nighttime, technically, but it’s a lot more evocative than the shot I captured Friday of the camper. The chill in the air reminds me the leaves on that tree won’t be there for much longer, but this was an evening when an ice cream treat was still appropriate for the season. A glimpse of the camper with the glow of the Wisconsin Dells in the background sounds better than it looks in this picture (though you might be able to see a star in the upper left quadrant of you squint). That’s not a toy spatula there, matey. A Minnesotan can’t think of summer without thinking about The Lake. It could be any one of thousands of lakes in the state with the tagline “Land of 10,000 Lakes,” but whichever one that is home to your camper/cabin/boat launch is known as The Lake. In my Minnesota memory bank of lakes is Big Pine Lake, Ottertail Lake, Long Lake and Rush Lake. If you didn’t live near a lake, then a swimming pool probably played a privotal role in your summer recreational locales. Summer is short in Minnesota, so you get while the getting’s good, and I remember spending hours every day swimming at the Wadena municipal pool and later, lifeguarding at the Sebeka Pool. No long after the tan lines fade, bodies of water in Minnesota solidify and anglers with nothing better to do go ice fishing, so the liquid in those summer watering holes is precious indeed. Today, the travels in my transplanted home brought me to edge of Lake Michigan north of Chicago. 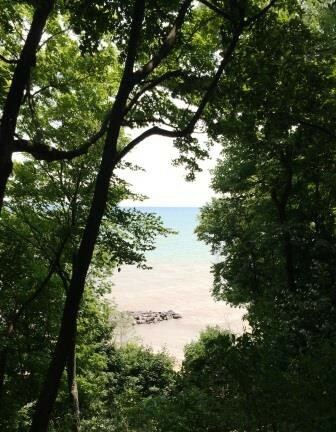 This shore shot through the shady trees reminded me of a looking glass. Instead of seeing an image of my face, I saw summer lovin’. Lake Michigan near Lake Bluff, Ill.